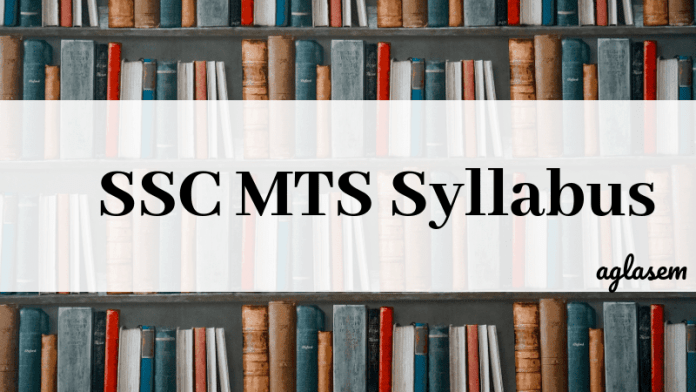 SSC MTS Syllabus 2019 – The SSC MTS examination is holding in two phases, the first phase i.e. Computer Based Test is from August 02 to September 06, 2019. The Skill test for all qualifiers will hold on November 17, 2019. For the aspirants of SSC MTS, the syllabus of the examination is like the fuel here on this page the SSC MTS Syllabus and exam pattern has been elaborated. The SSC MTS Syllabus is helpful for the candidates who are preparing for this year recruitment exam and who are focusing for the next year. Get here all the details of SSC MTS Syllabus 2019. Before going for the syllabus the candidates should have a thorough look at the exam pattern. In SSC MTS, the paper is conducted in online mode, and objective type question is asked in the exam. While in the second examination the candidates are tested for their communication skills. The page contains the elaborated information on SSC MTS exam pattern and syllabus of each paper. The first step in the selection process is CBT. The candidates have to under the online test. Tip: The candidates should not make the blind guesses as there is the provision for the negative marking. The Skill Test is qualifying in nature and the candidates are selected on the basis of their marks in the CBT. As there are four subjects which are asked in the paper I, the candidates can look at the detailed syllabus of SSC MTS. Note: For Visually Handicapped candidates of 40% and above visual disability, who opt for Scribe, for them, the paper doesn’t contain the question of Maps/ Graphs/ Diagrams/ Statistical Data in the General Intelligence & Reasoning / General Awareness Paper. Paper II which is also known as the descriptive paper, consists of 1 questions here candidates have to write an essay/letter. The qualifiers of paper I appear for paper II. The candidates have to give their skill test in either Hindi / English or they can write it any language mentioned in the 8th Schedule of the Constitution. The primary aim of the test is to assess the basic language skills and educational qualification prescribed for the post. The candidates have to write a short essay/letter in English / Hindi / any language mentioned in the 8th schedule of Constitution.